Please contact owner Crispin at 360-201-three seven eight nine. 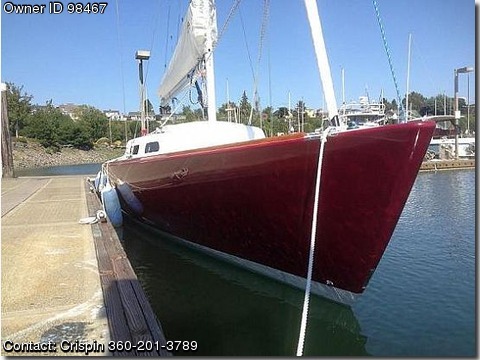 Boat is located in Bellingham, Washington. Performance Day Sailer with a 16' cockpit for family and friends. Doyle Stratis sails Jib, Roach Main, Spin and Code 0. Teak rail and laminated wood tiller, 3 winches, Has Kenwood AM/FM CD USB new 2011, VHF, anchor, bilge pump, Coast Guard pack, Ritchie compass, depthfinder, GPS, full gauges, head, mooring cover, Tactic wireless electronic system, canopy over boom, wind instruments, storage, original owner, prof. maintained, rigged for single handed sailing. Raced twice First place and Second. Designed by person trained at Sparkman and Stephens, built in Rhode Island.